East Coast Solidarity Summer, a social justice leadership and empowerment program for youth of South Asian identities. They organize a five day retreat in the summer. It focuses on community-building through engaged, supportive peer learning. ECSS provides a space for young people to examine local and global systems of injustice. It’s a place where they can access what activism and justice can look like through critical perspectives. Learning about South Asian history and my own identity has been empowering, illuminating and humbling. I joined ECSS to deepen my understanding and to help others find a similar sense of empowerment. It’s a place where we come together through critical engagement of our strongly cared about issues. 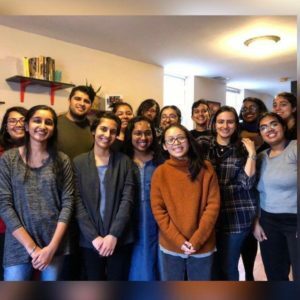 It provides a unique space for people with connections to South Asia to develop a community, learn about our intertwined histories, and build meaningful solidarity. The folks in this organization are deeply committed to creating a more just and loving future. ECSS is 100% community organized and funded. The entire organization’s work is done by volunteers . All funds go towards putting on the retreat and covering costs for participants. It would be a powerful act of solidarity for Western yoga practitioners to support this kind of empowerment work, given the yoga industry’s complex connection to South Asia. My classes are challenging but accessible. I offer a meditative flow with options for all experience levels. Typically a classes starts with a meditation, moves into a warm-up then a playful vinyasa flow. We end with some deeper stretches and a long savasana. Depending on what students request, I’m always willing to make my classes more restorative or more energizing. I tend to offer options for beginners and more experienced practitioners. We will also work on developing awareness of our breath and bodies. I welcome everyone to my class, especially folks who may have found yoga spaces to be uncomfortable or intimidating in the past. Please note that the Dupont studio has four flights of stairs leading to the entrance. Sign up for one of Saloni’s donation class, here.